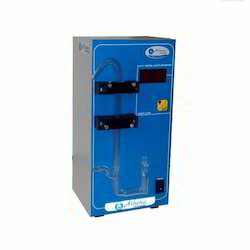 Pioneers in the industry, we offer digital gas flow meter, ion chromatography equipment, digital bubble flowmeter, gc digital gas flow meter, head space gas chromatograph and gas chromatograph from India. are ideal for measuring gas streams with composite gas composition. These flow meters are easy to maintain, by simply replacing the cartridge once a year to keep the meter compliant. There is no more need to ship your meter back for a 3rd party recalibration, simply order and replace the cartridge yourself. Introduction:HF series digital gas testing flow meter, use principle of micro-bridge gas qualitysensor have heat transfer theory. When gas goes through the sensor inside parts, theheat it takes is proportional to gas flow ( or gas quality ), and finally reflected in sensoroutput voltage. 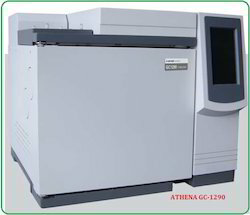 This flow meter mainly used with gas chromatography system, in order totest carrier gas flow parameter proportion analysis. To replace traditional soap meter.Increase working efficiency. Instantly could read gas flow rate. Very easy to use.Attention: this flow meter is only to be used for working condition of gas parameters ofreference.Not for commercial gas flow testing. Feature:1. Use special micro bridge gas quality sensor component to test, flow rate testing isaccurate2. Inside has battery, no need to use extra power supply, could be used at any location.3. When batter is short of power, has indication to replace.4. 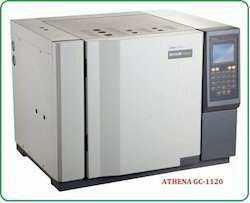 Only used with GC instrument. Fully inert PEEK based modules engineered for high performance, ease-of –use and reliability. High stability anion / cation exchange column ensures superior separation efficiently. Conductivity detector with integrated design and plug and play capability, with sensitive detection performance, could detect a wide range of samples. 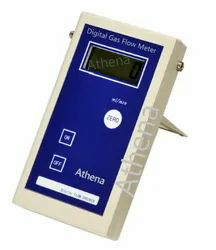 Our competency lies in offering our clients an excellent quality range of Digital Bubble Flowmeter. Our offered flow meter detects the bubble enters and exits in the calibrated tube. This flow meter is perfectly designed with the use of impeccable grade components and latest technology under the supervision of dexterous technocrats who hold vast experience in the domain. This flow meter is highly acknowledged in the market for its easy operation and optimum finish. If the amount of gas exiting a column or split vent is measured in units of volume, the flow rate is volumetric based. For example, measuring the volume of gas in milliliters (mL) per unit time in minutes will result in a volumetric flow rate in mL/min. The most common device for measuring a volumetric flow rate is a bubble flowmeter. These devices are used to determine flow by measuring the time required for a gas stream to move a soap bubble through a specific volume. Line Size 1/4" / 1/8"
Up to three injectors may be installed and operated imultaneously with independent temperature control. Wide range of injectors is available to be chosen from for various applications. It is very convenient for installation and disassembly of sample injectors. Sample Injector with Mono Packed Column/Double Packed Columns Several alternative sample introduction methods, including on-column sample introduction and six-way valve injection; Adapter for injection to capillary column (0.53 mm i.d.). Sample injector for capillary column Special sample injector with septum purge and back-pressure valve splitting; Special programmable split/splitless injector with solenoid valve, septum purge, back-pressure valve splitting, and standalone carrier gas and make-up gas flow; Modified dual-packed-column sample injector for injection to capillary column by employing some connectors and back-pressure valve splitting. Carrier gas control with constant pressure valve and constant flow valve; Air and hydrogen control with constant pressure valve and needle valve; Flow easily adjustable through constant flow valve and needle valve with digital display; High precision, reproducibility and reliability. Up to three detectors (FID, TCD, ECD, etc) may be installed and operated simultaneously. Simultaneous multi-detection with detectors in series or in parallel meets the various analysis requirements. The new FID provides higher sensitivity than ever before. It is very convenient to disassemble and clean the jet and collector. Precisely fixed emitter configuration ensures conformity of product performance; Excellent TCD detector with high-resistance tungsten-rhenium filaments provides high sensitivity. A sensitivity of 10000 mV·mL/mg is achieved with optional amplifier circuit board. Special configuration of air heat insulation enhances the stability of TCD detector Constant-current, pulse-modulated ECD detector sets sensitivity and current by computer. Temperature-limit setting and overheat protection. Instrument control is accomplished through the keypad, and the instrument offers outstanding capabilities. Ten methods saving and reloading??? Temperature setting values, actual values, retention time and analysis time display. Supports 5 oven ramps with 6 plateaus. Temperature Control Object Column Box, front and back detector, front and back sampler, assist total six channels. Up to three injectors may be installed and operated simultaneously with independent temperature control. installation and disassembly of sample injectors. Adapter for injection to capillary column (0.53 mm i.d.). Modified dual-packed-column sample injector for injection to capillary column by employing some connectors and back-pressure valve splitting. High precision, reproducibility and reliability. multi-detection with detectors in series or in parallel meets the various analysis requirements. 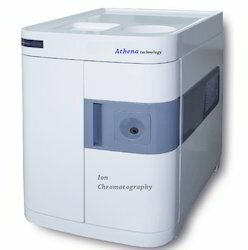 Looking for Gas Chromatography ?